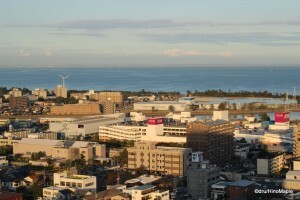 Tsu is the capital of Mie Prefecture with a population, as of 2012, of less than 300,000 people. It is a pretty small city by Japanese standards and Mie Prefecture is a pretty quiet prefecture as well. The capital city felt very much alike Chiba or Hachioji compared to Tokyo, but on a much smaller scale. Everything in the area is pretty simple and the main station is pretty bare. There are things to see and do in the area but if you ask me, it isn’t particularly interesting for a regular tourist. The main reason I visited Tsu was to go to Suzuka to watch the F1 races, and Tsu was a convenient place to stay for the evening. I doubt I would have visited Tsu if it wasn’t for the F1 race. While I didn’t really find much to see or do in this town, do note that I was only there for a day and did minor research into the town itself. Tsu isn’t a bad town and the views from my hotel were wonderful, so don’t let that discourage you from at least looking into it a little more than I did. There really is only one thing to do when you are in Tsu; visit Tsu Castle. Tsu castle is a bit of a misnomer. 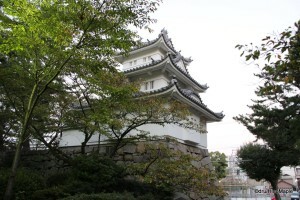 While Tsu Castle is a true castle ground, it isn’t a castle in the sense that a castle exists there anymore. It is basically the ruins of the original inner castle with only 1 guard tower having been rebuilt to more aesthetic standards. The easiest way to get to Tsu Castle is to take a bus, any bus, from Tsu Station and get off at the first major intersection. All buses heading to and from Tsu Station head along a major street and then split off with most buses heading south and others heading east to the coast. While you do have to be careful about where you get off, it doesn’t matter what bus you take there and back. From the bus stop, it is a short 2 minute walk to the castle ruins. You can still see the original walls, part of the inner moat, and where the original gates used to be. As you approach from the main street, you will easily see the reconstructed tower as it is located at the main entrance. Once you are there, you have the option to walk up to the tower and enjoy the view from the top of the castle defense wall. I found it to be the best part of the entire castle area but it could have been the timing as well since I was there around sunset. 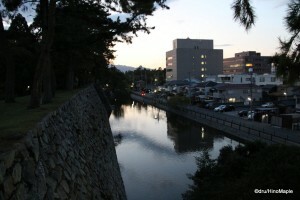 When I arrived at Tsu Castle, it was around sunset and the natural light was fading fast. 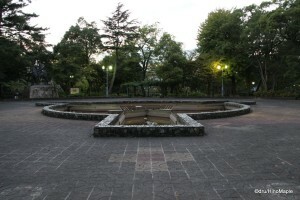 The main castle keep area has been converted into a fountain, and when I visited, the fountain was not being used. In fact, the entire castle area was dry. There is still a quaint little garden in the back, north-west corner, and it takes about 5 minutes to walk all around it. It is still in a traditional Japanese style and I can imagine that enjoying a nice lunch in this park in the summer must be wonderful. The entire castle grounds are now a public park and to be honest, you couldn’t charge anyone for what you saw. There really isn’t anything special to see in this castle, although I’m sure the history of this castle is very important. I wouldn’t go back to see this castle again unless I was living in Tsu and I doubt that would happen anytime soon. Tsu Station is also somewhat boring. It is a great place for a pit stop and there are a lot of hotels around the station. I would imagine that having a car is essential to doing anything around Tsu. Like many small rural communities, cars are the lifeline of these areas. I did do a short walk around the area and aside from the izakaya and other restaurants to the south of the station, there really isn’t much happening there. I was lucky enough to stay in the tallest hotel so that my room was on the top floor, and luckily it was facing Ise Bay as well. Waking up to the beautiful sun and the view of the bay was magnificent. I only wish I had more time to enjoy the view but the nature of going to an F1 race means you don’t really have the luxury of time when it comes to enjoying the cities you stay in. I do wish I had a bit more time to explore the area, but I think I would need a car as well. Overall, Tsu is a good stopping point for people doing a tour of Mie. I wouldn’t recommend spending more than a full day, and even a short half day stop on your way to Ise Shrine would be more than sufficient. When I did talk to the front desk to ask about Tsu, I also checked whether there was anything else to see in the area, and even they didn’t have much of an idea on what other things I could see. 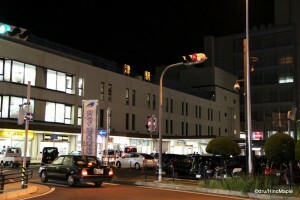 Rather than visiting Tsu, I would consider stopping in Matsusaka instead, which is just south of Tsu. Matsusaka is famous for its wagyu beef but I am afraid I didn’t get a chance to try it. It is pretty expensive and it is almost more famous than Kobe beef in Japan. Tsu has a lot to live up to in terms of tourism, and I’m afraid they lost when being compared to Suzuka Circuit to the north, and Matsusaka and Ise Shrine to the south. Even Nagoya is better for tourists than Tsu; but I can at least cross off another city that I had wanted to visit. I can now say that I have visited the city with the shortest pronounced name in the world. Next stop, Wales for the longest name of a city in the world. This entry was posted in Chubu and tagged castle, Castle Ruins, F1, Ise Jingu, Ise Shrine, japan, Japanese Castle, Japanese Castle Ruins, Matsusaka, Matsuzaka, Mie, Mie Prefecture, Suzuka, Tsu, Tsu Castle, Tsu-jo, Tsujo by Dru. Bookmark the permalink. A name just 1 character long is difficult to beat! “I would imagine that having a car is essential to doing anything around Tsu.” I was in Adachi earlier today and I realized that you need a car in Adachi! Or rather, a scooter to navigate those small, twisting roads. Adachi has nothing to do with Tsu but my comment is related to cars. Sorta. Technically, wa has “2 sounds”. Almost an u and then an ah. 😉 I’m just proud of Japan. Wa sounds like a great name for a town too. I wonder what other short city names are in the world. Adachi needs a scooter? I remember my friend had a problem like that before. I always forget that north is still an area too. I need a car/bike/scooter. Just to have fun, but I doubt I’d use it. I have a slight interest in going to that museum and a few places in Tsu, but have never committed.